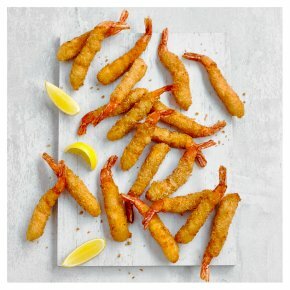 24 king prawns with a deliciously crisp seasoned breadcrumb coating. Try serving with a simple garlic mayonnaise or sweet chilli dip for an extra layer of flavour. INGREDIENTS: king prawns (Penaeus vannamei) (crustaceans) (57%), wheat flour, water, sunflower oil, tapioca starch, salt, sugar, sago starch, yeast. For allergens, including cereals containing gluten, see ingredients in bold. May contain: soya.